Hybrid cloud is more than a stepping stone for enterprises making moves to cloud, says BMC CTO Kia Behnia. It’s the final destination. The company formerly known as Research In Motion attempts a comeback with the BlackBerry 10 OS, which boasts thousands of apps and a unique interface. 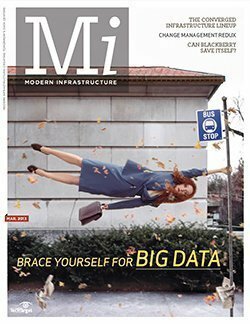 Spreading out storage and compute may ease the burden of big data projects on data center staff and infrastructure. That old configuration and change management plan was unwieldy and out of reach, but the need for having one hasn't gone away. Companies seeking an easy way to manage and monitor changes in their environment have a variety of tools to choose from to assist IT shops. Several big-name vendors have converged infrastructure products, but which one fits best in your data center? IT departments looking to make their lives easier are looking to the converged infrastructure market for the simplicity these platforms can deliver. IT must learn to juggle current systems and new big data platforms or face the chaos of disparate systems. Outsourcing data center operations is popular among businesses seeking flexibility and low costs, but the plethora of providers muddies the water. Enterprise IT strategy has long been based on straight-line extrapolation, but the industry must learn to embrace chaos if it hopes to thrive.